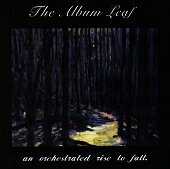 Tristeza's Jimmy LaValle's debut solo album, AN ORCHESTRATED RISE TO FALL, released under the project name The Album Leaf (used in naming pieces in the Romantic era, translated from the German word "Albumblatt") is a sonic collection of minimalist instrumentation that incorporates improvisational jazz, drum and bass, emo, and post-rock. The hybrid of the songs, and the fact that LaValle has been musically trained since the age of four (mainly in the Romantic era of classical music), creates a moody, atmospheric structure for LaValle to experiment with, while allowing himself the freedom of a boundary-less platform to write songs in. The album itself is a slow, intertwined collection of emotions, life, beauty, and nature. It's sophisticated, intimate sound is perfect to sit and relax too, playing it in the background while soothing you so you can complete the rest of your day in harmony and piece. It is the type of album that never sees playing time when you want a good time, but rather the one album you can always turn to when you want something smooth and calm; something to unwind too. I'll give it a B.